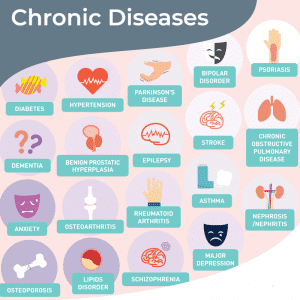 CareClinic is a treatment tracker that can help manage any chronic condition or symptoms that one may be experiencing. CareClinic helps you take back control of your life. 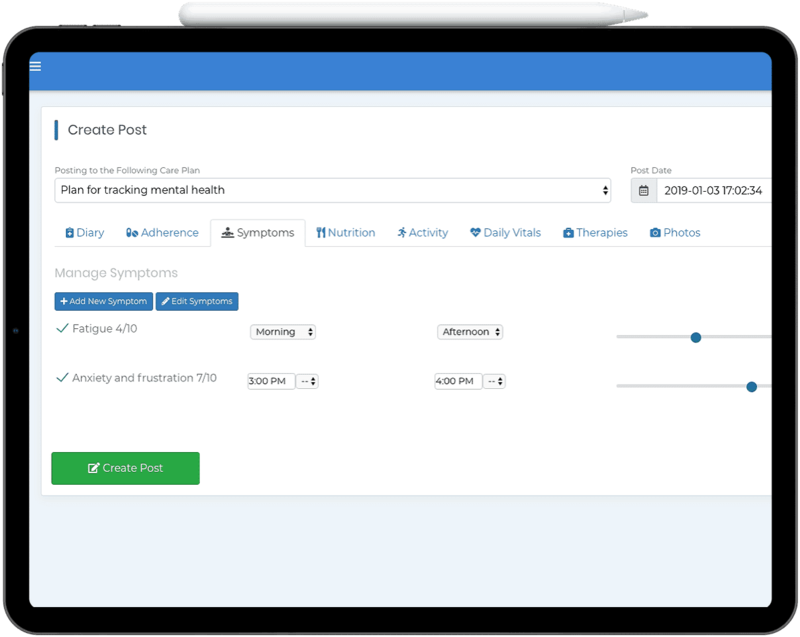 CareClinic comes with many built-in features to kickstart your needs for trackings symptoms, medication and your overall treatment. Patient self-care is at the heart of what makes CareClinic the #1 platform for managing treatments. We are with you every step of the way, regardless of where you are in your treatment cycle. Our platform is designed to help you build a treatment plan quickly, one that you have designed by yourself or in conjunction with your health. Add any intervention type such as: drugs, supplements, physical activities, therapies and even certain foods as part of a diet. Additionally track physical activity, your daily vitals including weight, sleep, blood pressure, mood, along with nutrition, therapies and medication and supplementation. Optionally create unlimited custom fields that you want to track that are relevant to you. Record your daily life in the diary, record your medication adherence, manage your day to day symptoms, and upload photos as a reference. 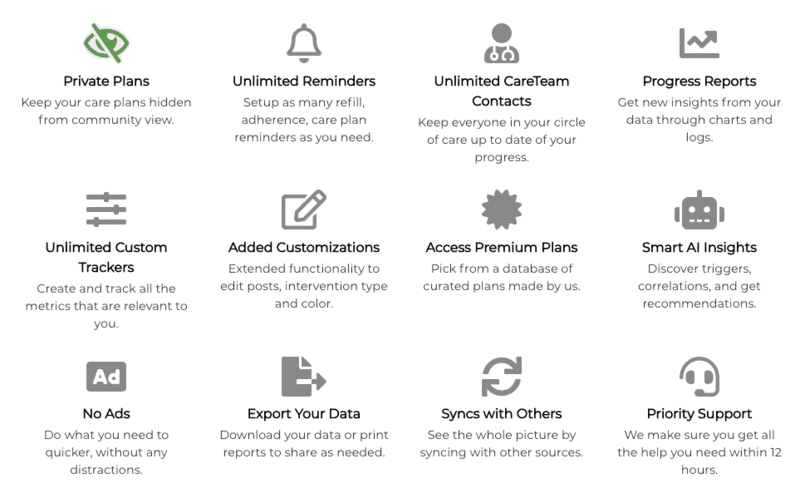 CareClinic was built to manage the simplest to the most complex medical regimens. Calendars: Get a monthly, weekly and daily view of what you have done and need to do for your health. CareTeam: Keep everyone in your circle of care in the loop about your health or monitor someone’s else’s health remotely. Save information about your caregivers here for future reference as well. Reports: See how other’s have done in logs and charts. News: For those using the platform from the web, see the latest developments related to your condition or symptoms. The first step is to sign up to CareClinic, if you haven’t already, click here to do so. Upon registering you will be guided through three steps to complete your care plan (if you are inputting your data from the website rather than the mobile app). The first step includes: Adding details for your plan, you are allowed to have different care plans for different things you want to track. Step two: Adding all your therapies/medicaments so we know what you are taking for your treatment and how much. Step three: Enabling reminders for your things you need a reminder for. If you require a reminder for your entire care plan, a single reminder can be sent letting you know to adhere to your plan. Otherwise individual reminders for each modality can be set as well. Which means you can set a reminder for specific therapies, specific drugs, and supplements as needed (along with refill reminders). At this point, you can now rely on CareClinic to help you manage your treatment and log your adherence. If you wish to review the results of your plan, you can take a look at Reports to see how you’ve been doing. The reports are generated based on each time you adhere to your reminders or make a journal entry. The best part about Reports is the “Correlations Tables” that are placed below the graph which provides you with information on the positive and negative correlations between different areas of health. E.g. You can determine if a particular drug taken on certain days is responsible for increased or decreased sleep, the same thing with physical activity and nutrition. This data can be exported and shared with your care providers as needed as well. Sign up to CareClinic for free to get started managing your treatment.